Is this stud "clean and dry"? Bolts and studs are often plated with Cadmium, Zinc, and other coatings that have published "K" (friction) factors. Torquing the bolt using a "clean-and-dry" specification produces a reasonably accurate amount of tension based on these 'K" factors. With new bolts and studs there are no cleaning issues for the mechanic as the bolt or stud is received in the "clean and dry" condition. What about old used bolts and studs? They are not received in the "clean and dry" condition. In what manner should the mechanic clean the surfaces? Should a wire brush be used to clean old thread locking compound from the threads? Threads create 50% of the friction resisting torque, the bearing surfaces create the other 50%. Does "clean and dry" apply to only the bolt threads? Or does it apply also to the bearing surfaces? A "clean and dry" torque specification for used bolts and studs without specific cleaning and inspecting directions is deficient. The "K" factor on some old used bolt and stud might be almost anything and vary from bolt to bolt. Not only engineers but mechanics should be aware of this limitation. NASA found this out during testing of a model wing in their 8' Transonic-pressure-tunnel when the flap peeled away from the wing, broke free, and proceeded down the tunnel. Engineers had specified a "clean and dry" torque. This was quite impossible as the assembly directions also specified that a liquid thread locking compound be applied to the bolt during assembly. The particular bolt was often removed and reinstalled during testing. What the technicians at NASA did was re-apply thread locking compound to the bolt each time it was installed. NASA lost the model wing when the bolt backed-out. NASA's "Lessons Learned" document states quite simply: It is impossible to predict torque value on screws after repeated applications of "a thread-locking compound". Why would a "clean and dry" specification be used? Clean and dry threads and bearing surfaces have greater friction than lubricated surfaces. Friction helps prevent the bolt or nut from loosening and backing-off. Clean and dry, uses friction to our advantage and can be an aid keeping fasteners tight. 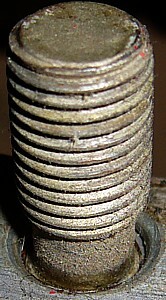 MIL-HDBK-60-THREADED-FASTENERS - TIGHTENING TO PROPER TENSION offers this description of "dry": "So-called "dry" threads refer to threads where no lubricant is applied. Some residual machine oil is assumed. If all lubricant is removed by solvent, coefficient of friction is inconsistent and often very high unless a plating or other film is acting as a lubricant. Severe galling may also result from lubricant-free surface conditions." It appears from the above quotation that a proper torque condition statement is "dry threads" rather than stating "clean and dry". 1. "Failure-of-bolts-in-helicopter main rotor drive plate assembly due to improper application of lubricant" by N. Eliaz, G. Gheorghiu, H. Sheinkopf, O. Levi, G. Shemesh, A. Mordecai, H. Artzi, Published in Engineering Failure Analysis #10, 443-451.